My name is Apoorv Nandwana and I am currently pursuing my final year of B.Tech degree in Biotechnology from Dr. D. Y. Patil Biotechnology and Bioinformatics Institute, Pune. The reason for choosing this field is with the goal of bringing about a positive change, through Environmental Biotechnology, to the ever-decaying environment of the world, especially India, using the modern biological approaches. Undertaking this nascent career path has not been an easy decision, however working towards a social cause from an early stage has been my motivation, which is why I opted to study Biotechnology to understand the subject to a greater extent. Jagriti Yatra is an initiative of Jagriti Sewa Sansthan, a non-governmental organization (NGO) that promotes entrepreneurship with the tagline of 'Building India Through Enterprise'. It is an ambitious 8,000 Km train journey for 15 days, which will take me with 500 other Yatris, who also the aim to build a new India through social entrepreneurship. The Yatra runs throughout India giving a peek into the amazing work which is done by some of the great grass root leaders in the country for our people, and giving a chance to share our ideas and interact with such eminent personalities; motivating us to materialize a vision for better India. In a broader aspect, this Yatra would help me in learning to become a job creator instead of a job seeker. To undertake something extraordinary in life, one must have the courage and motivation to work towards it with all the determination and power until you reach your dream. I will like to quote a few lines from the movie 'The Pursuit Of Happyness' - "Don't ever let someone say that you can't do something. You got a dream. You gotta protect it." This is my dream and I am striving to achieve it. This quest of mine would be enhanced when people with similar mindsets come together so that something beautiful can be created for the betterment of mankind. I deserve the sponsorship because I think the economic situation shouldn’t hold back an aspiring individual from learning, achieving and sharing something in their life. 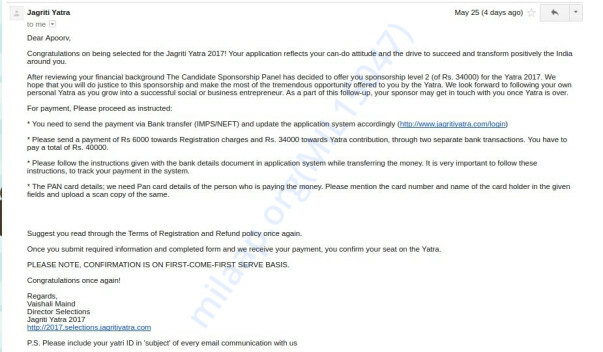 And I believe that people like you, who are reading this right now will help me to achieve my dream to go on the Jagriti Yatra.